Since moving to Centennial State in 2005, I have not met more than a handful of people who share my enthusiasm for steel on four wheels. Bicycles, most certainly (it seems like the typical household in Fort Collins contains an average of around six bicycles), but automobiles, no. The stereotypical Coloradan will own a Subaru station wagon to transport sporting equipment and/or dog(s) from Point A to B, but out here it is hardly uncommon when the said cargo costs more than the car. I know several people, for example, whose carbon-fiber triathlon bikes decked out with aerodynamic, deep-dished wheels and electronic shifting easily cost more than their 25-year-old Outbacks. So considering the relative automotive indifference in my current home state, it has been quite refreshing to now have a friend in Northern Colorado who appreciates cars for more than their mundane transport abilities as much as I do. Never mind that my friend Manuel has lived in Córdoba, Spain, for the first two decades of his life. 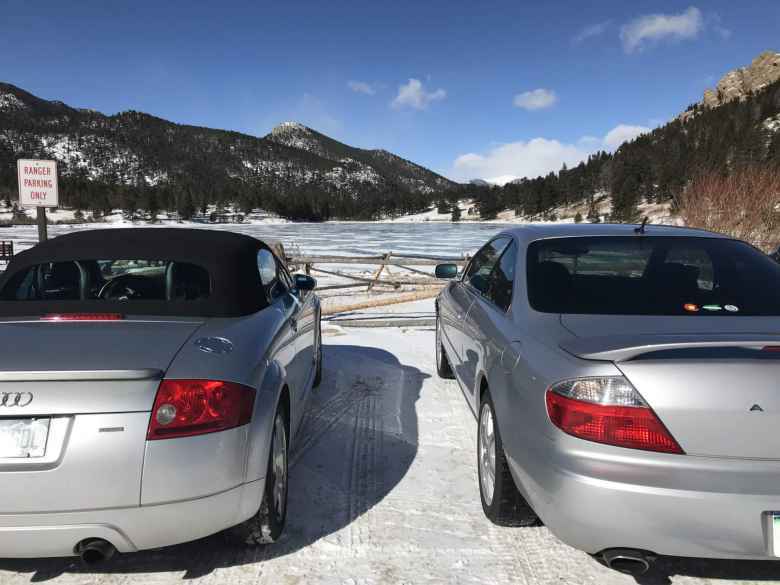 (Here’s some car trivia for you: Chrysler made a personal luxury coupe in the 1970s called the Chrysler Cordoba that sold well enough to help the manufacturer stave off sure bankruptcy, and SEAT made a car called the Córdoba as well.) He may have lived in the U.S. for only seven or eight years, but he knows way more about cars sold in America than most Yanks who couldn’t distinguish between a Honda and a Hyundai. Speaking of Hondas, Manuel is a fan of the marque that was founded by a humble, yet ingenious, high school dropout named Soichiro. Manuel once owned an eighth-generation Honda Accord Coupe—the one that Mercedes-Benz blatantly cribbed the styling of with their 2011-2015 C-Class Coupé—that would later on be called by Road & Track’s Jack Baruth as “the last real American muscle car” with only a hint of irony and hyperbole. 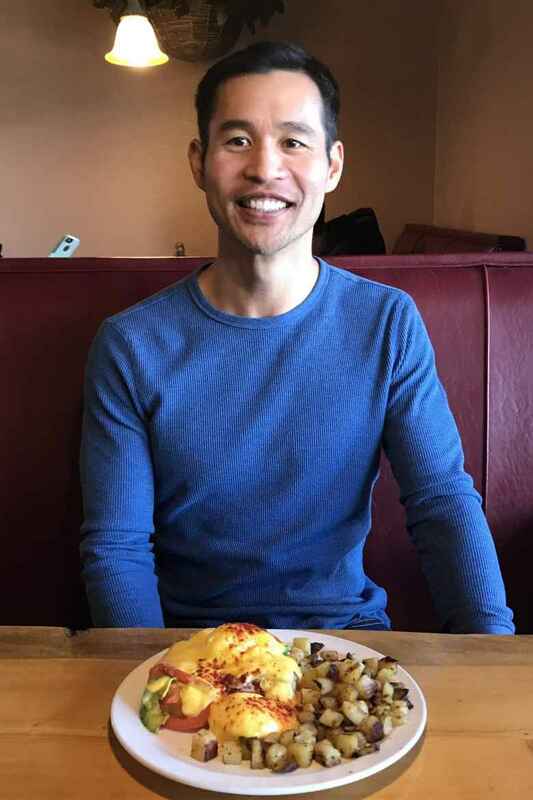 Manuel later sold the Accord to to buy a seventh-generation Volkswagen Golf GTI, which he utterly loved but ultimately deemed “too unreliable.” To give his wallet and sanity a break while attending graduate school, he then returned to Honda’s corner and replaced the German hatch with a second-generation Acura CL. His silver CL coupe has a proper manual transmission like his former autos and six of the seven cars I have ever owned. In this day and age where Americans’ laziness quest for convenience and quick-shifting, dual-clutch automated gear changers have rendered the stick shift all but extinct, this choice of transmission may be the clearest litmus indicator of an automobile enthusiast. 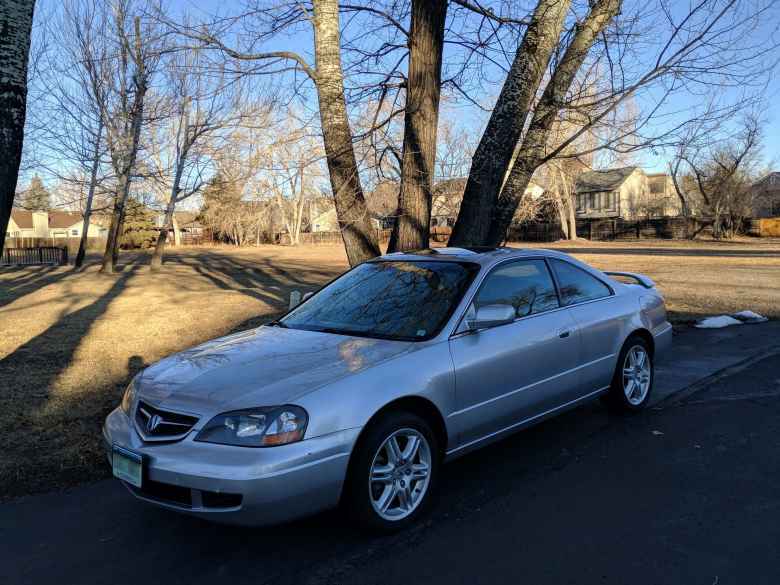 It was the recent purchase of the Acura that inspired Manuel to say the following words: “Felix, we should go for a drive sometime.” Not just an around-the-block spin, but a bona fide driving tour of the sort I used to do regularly when I lived in California. Ultimately, we did so one fine Sunday morning in February. It was a way to depart the arrow-straight, north-south and east-west roads of Fort Collins proper into vastly more interesting, wending terrain such as the river-lined Thompson Canyon from Loveland to Estes Park, the gorgeous Peak-to-Peak highway from Estes to Allenspark, and the winding State Highway 7 that plunges from Allenspark into Lyons. 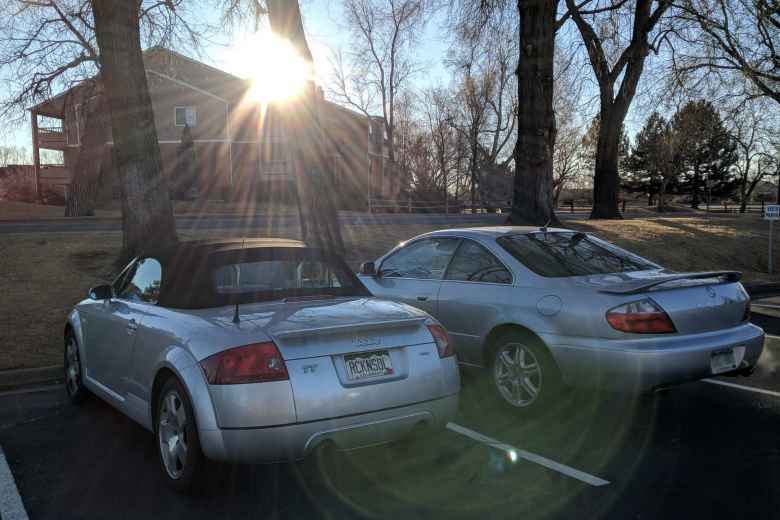 The initial rendezvous point for Manuel’s Acura CL and my Audi TT Roadster Quattro was in south Fort Collins at 7:50 a.m. We hung around for a few moments to snap a few photos and also to see if a friend/would-be passenger had awakened in time to join us. Negative. Hence it was just us two dudes. No problem at all. Midway through the drive we stopped by the Notchtop Bakery & Café in Estes Park for an scrumptious brunch. 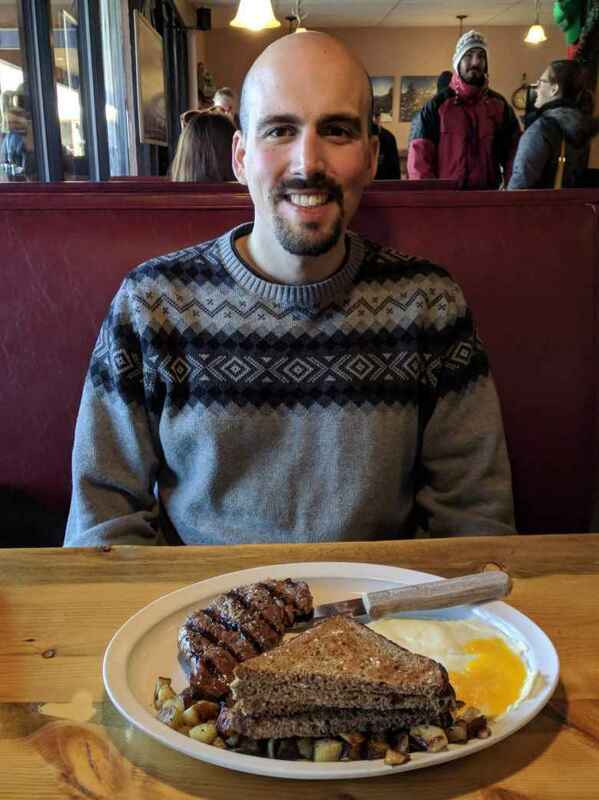 Manuel had steak skillet while I devoured eggs benedict. Both were excellent. Then, came the main event: the Peak-to-Peak highway. There was snow on the edges of the road, but none on the pavement to make driving squirrely. In case of black ice, however, we drove at a brisk-yet-cautious clip. Fortunately, with the roads and scenery, no Jimmie Johnson driving impressions were necessary to stay amused. Before descending through St. Vrain’s Canyon from Allenspark to Lyons—the de facto end of the scenic tour—we made an impromptu stop at Lily Lake. Neither of us knew of this lake before, but were enticed by the roadway signs indicating a scenic turnout. The views indeed were precious. The total time of the drive, including brunch, was just under five hours. The video below, for your viewing pleasure, condenses those five hours into a single minute. “We need to do something like this again,” Manuel and I agreed. Where to? 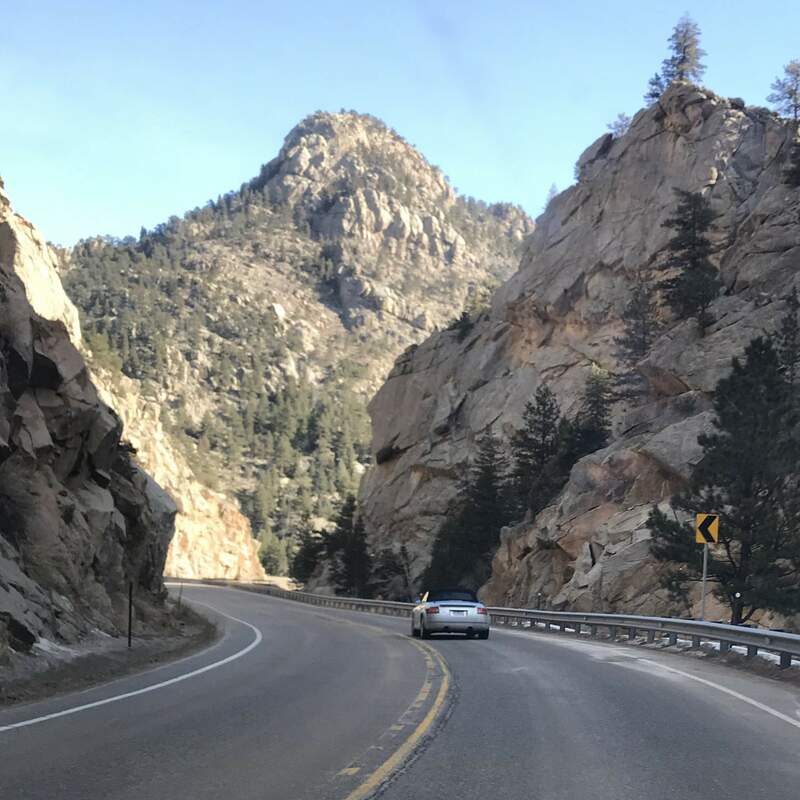 We’ve been musing the mountain town of Black Hawk, which would certainly be a much longer drive, but would be to a place I have never been to. 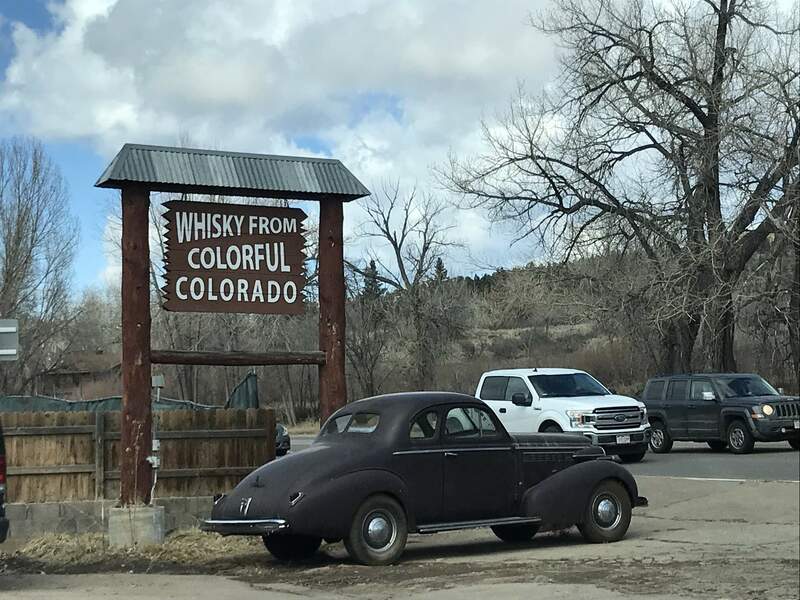 If you have any suggestions for another place in northern Colorado, please leave a comment. You’ve not been to Black Hawk? Hmmm! Bring your money & your running shoes. There’s a gorgeous trail that follows the mountain all the way past Black Hawk. After that you play some Craps, Blackjack some slots and then you eat all you can eat crab legs at the Isle of Capri. Haha. It’s awesome. ??? ?